This pre-assembled cable has been designed for the sole purpose of preventing the formation of ice dams on pitched roofs with non-combustible tab shingles and in metal or plastic gutters and downspouts. It provides drainage channels so that as natural thawing occurs, water has a path to flow off the roof and through the gutters and downspouts. 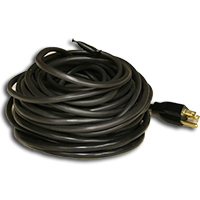 This cable is not for use on a flat roof nor is it intended to clear the roof of snow and ice. The installation of this product is simple and it can be used with either metal or plastic gutters. Read and follow all instructions and pay particular attention to the following points: Install the cable when the outside temperature is above 50˚F because at lower temperatures shingle material may be brittle; Clear all leaves, pine needles and debris from the roof, gutters and downspouts before operating the cable. Do not plug the cable in unless it has been completely uncoiled or it will be damaged. Each package contains one ready-to-install cable, shingle clips, cable spacers and complete installation instructions. You will also need a tape measure, marker, gloves, ladder and a weatherproof GFCI outlet with control switch. Click here to use our handy online length calculator. They can be applied on pitched roofs with non-combustible tab shingles, in gutters and in downspouts. 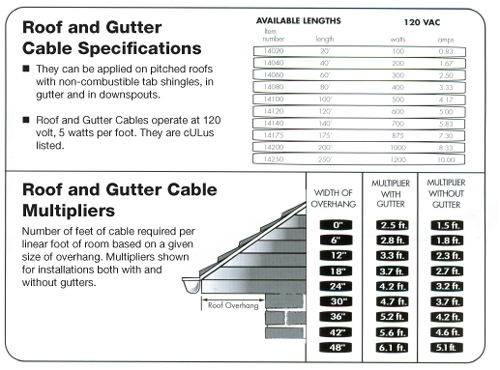 Roof and Gutter Cables operate at 120 volt, 5 watts per foot. “I live in the icy cold north. …After three years of dealing with three ice dam areas, including two years of serious water invasion and one year with only minor invasion, I gave up and tried these cables — …I’m glad I did, because it is IMPOSSIBLE ($$$$$$) to change your roof profile…BUT IT IS WONDERFUL TO GO FOR FIVE YEARS WITHOUT DAMAGE AND REPAIRS!! !